Throughout the ages, many schools of magic have been created and also destroyed. Some have come under attack due to ignorance; arts such as Necromancy and Enchantment have been targeted in particular. 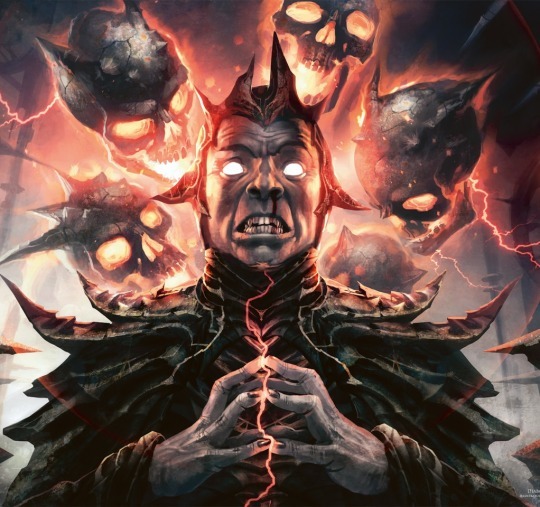 Among the most notorious is the art of magic inspired by fiends. The school of Diabolism is such an art, where contact with dark planes leads to manipulating vile energies into wholly new effects.dedicated to dark gods and demonic creatures. While many styles of magic are unlawfully targeted and discriminated against, the diabolists are almost always cruel and wicked. While pacts with otherworldly beings are the results of enslavement, diabolic mages intentionally scour obscure tomes and demonic rites to enhance their magical craft. Some are connected to patrons like warlocks, while others steal devilish secrets for their own purposes. Warlocks forge direct deals with fiendish beings. Meanwhile, most Diabolists cheat their way into obtaining fiendish magic, often resulting in horrific consequences. That said, many Diabolists are active within cults and truly follow their infernal agenda to its fullest extent. Esoteric Knowledge – Upon taking this archetype at level 2, you gain some of the skills associated with dark devotion. You are proficient with the Religion and History skills. Furthermore, you can elect to give yourself advantage on either skill check. You must take a short rest or long rest before doing this again. Upon reaching level 10, you may use this ability twice before rest. Devilish Research – Diving through vile tomes and demonic scripture has gifted you with knowledge of dark arts. At levels 2, and every subsequent level until 18, you may learn 1 warlock spell equal to the highest level spell you can cast. This spell is added to your spellbook and may be cast as a wizard spell. Damnation – A Diabolist has accepted the powers of Hell into them, dooming their souls. When a Diabolist dies, their souls are sent to Baator, The Nine Hells. Furthermore, you trigger off spells like “Detect Good and Evil” and similar abilities. Casters trying to resurrect or revive a damned character must succeed their spell save DC. Failure results in the spell also failing. Fiendish Resistance – At level 6, you build up defenses against magical power similar to your dread power source. You gain resistance any damage element of choice. At level 14, you gain advantage on saving throws versus poisons (poisoned condition) and resistance to poison damage. If you already chose poison damage, you may choose another damage type. You can change your non-poison element to something else after taking a long rest. Magic Weapons – The creature’s attacks are counted as magical. Magic Resistance – Creature has advantage versus all spell saves. Weapon Resistance – Resist vs. non-magical Bl/Pr/Sl damage. After casting your spell in this manner, you must take a long rest before using this ability again. Infernal Terror – When you reach level 14, you can inflict wretched imagery of the hells below upon all in your path. As an action, all creatures within 30 ft. of you are subject to a devilish illusion so real it creates a burning sensation. They must save against your spell DC or take 3d10 psychic damage as well as 3d10 damage from the element you chose in Fiendish Resistance; also becoming frightened until they succeed versus fright. Targets that succeed the save take have damage and are not frightened. Creatures that are immune to charm or fear effects are not affected by this ability. You must take a long rest before using this ability again. However, you may attempt to do it once more. Doing so results in you suffering the same effects as the target for over exploiting the forces of the underworld themselves! However, you do not have the ability to save against it. You also do not gain any benefit of resistance or immunity from the damage. This class is pretty much set in fiendish powers. Just because it’s focused on devils doesn’t mean you can’t tinker it to fit demons, daemons, and demodands as well… or for that matter, a whole heaping of Lower Planes nasty nasties to sample from. By all means, you could use it for another source of extraplanar beings… especially one with a questionable moral agenda. Made by Doctor Necrotic for Doctor Necrotic Media.